Walking up to the elegant, well-lit foyer, the host checks you in at a pearly white stand in front of a black marble wall with the golden Scotch 80 Prime logo on the center. Once inside, the white linen tables and gold- en seats are bright against wooden paneling and more golden, geometric accents. The vibe is cool, ethereal and impactful. Best of all, in the back of the house, Chef Barry Dakake will be taking care of your food. Chef Dakake grew up in Rhode Island where his uncle owned a few ice cream and sandwich shops. The kitchens became his sanctuary and it was there he realized his penchant and talent for cooking. Being accepted into culinary school straight out of high school began Chef’s journey to culinary notoriety. After culinary school, Chef Dakake was offered a job working at Aureole in New York under Chef Charlie Palmer, whom Chef still admires. However, Chef worked mostly under the supervision of the sous chef, who made the daily job, “like Hell’s Kitchen times ten”. It was this experience that made Chef realize he wanted to be a positive and nurturing mentor in the future. 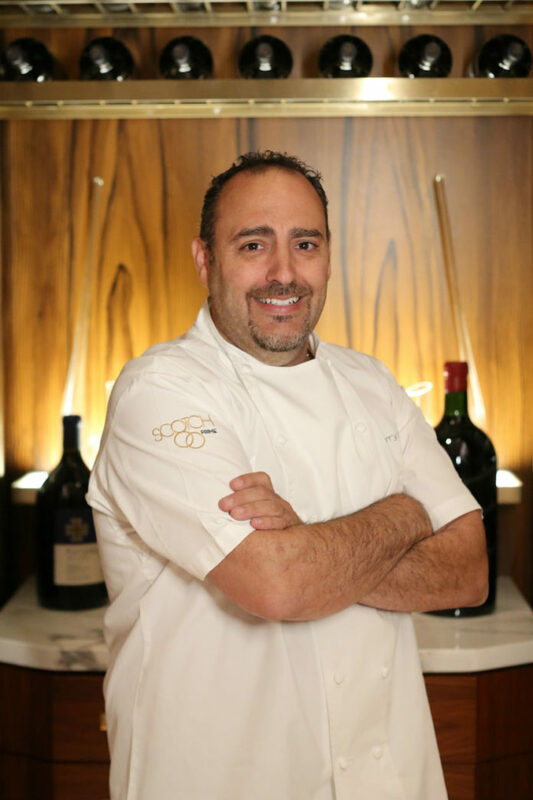 Chef got his first chance to be a leader in 2001 when he helped launch N9NE Steakhouse at Palms Casino Resort in Las Vegas. He had made it to a mega culinary hub of the world. Now, Dakake is the Executive Chef of Scotch 80 Prime, which opened in May of this year in the old space of N9NE Steakhouse. Although he’s achieved success as a head chef in Vegas, Chef is still a dreamer, believing that once you stop dreaming, you might as well throw in the towel. He knows that bigger or flashier does not always equal better, and instead, chooses to focus on the flavor profiles of his dishes. As a leader, Chef Dakake believes in teaching his employees with kindness, even when they make mistakes. In his words, “You treat wounds with honey, not vinegar”. Chef also treats the hotel and restaurant guests with kindness, and occasionally prepares meals for room service. He also oversees hotel events and banquets both on or off-site, that include items from his menu. When it comes to food sources, Chef does miss the ability to walk down to the pier to get fresh lobster as he could on the East Coast. However, he has found no shortage of quality suppliers near his area in Vegas. Chef Dakake earnestly believes in respecting animals and always sources from farms that treat their animals humanely. In fact, whether it is for produce or meat, Chef takes the time to visit the places his restaurant will source from, so the quality is always up to his standards. Chef is also passionate about ending hunger and is active in the Culinary Council, a division of 3 Square Foodbank and many other organizations that help those in need. Chef Dakake still works crazy hours as any dedicated chef would, but he makes sure to take time for fun in his life via the occasional vacation. One of his annual vacations is a trip to Newport Beach in the summer. At home, one of Chef ’s biggest supporters is his fiancé, Shenik. The couple also has two food- snob dogs, Coco and Viviana, who eat carrots. Specifically and exclusively, organic carrots from Melissa’s Produce. Chef Barry Dakake values a simple life. As he says, you just need to “Eat- Dream-Love”. DESCRIBE YOUR LAST SUPPER This would be the party of all parties for me. I would have it back in RI at my friend George and Lori Pesce’s ocean-front beach house where all of my friends and family would attend, and my band of choice would be the Beach Boys. My last supper would be a New England lobster bake with all the fixings adding to the dinner would be Rhode Island-Style Baked Stuffed Shrimp, Rhode Island Lobster Rolls with a side of local garden leaf lettuce, sweet red onions, cucumbers, cerignola olives finished with red wine vinaigrette. You can’t forget the starters though—Stuffie Baked Clams, Fried Point Judith Squid and Olneyville New York System’s Hot Weiners (a Rhode Island hot dog), and three types of clam chowder—Rhode Island, New England and Manhattan. My drink would be J.J. Prum Graacher Himmelreich Spatlese Riesling 2012 and Dom Pérignon Rose 1988 and the soft drink would be a frozen slush from Dell’s Lemonade and my late Aunt Carmel- la’s fresh lemonade.